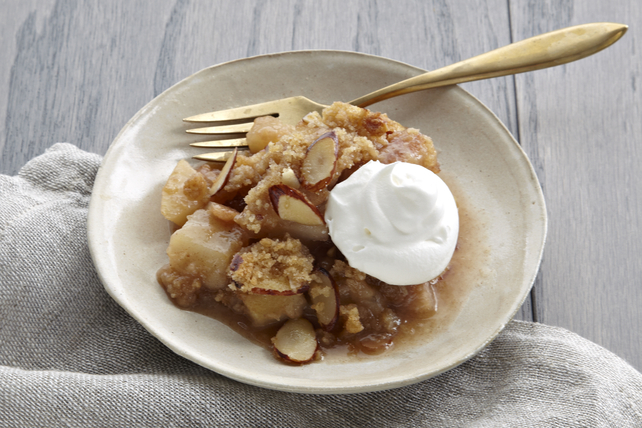 Warm pears, with a touch of cinnamon and a buttery crumb topping - sounds good right? Our Perfect Pear Crisp is sure to become a new fall favourite dessert recipe! Grate enough lemon peel to measure 1/2 tsp. zest. Squeeze enough juice to measure 4-1/2 tsp. Mix 1/4 cup granulated sugar, 2 Tbsp. flour and 1/2 tsp. cinnamon in large bowl. Add pears, lemon zest and juice; toss until pears are evenly coated. Spoon into 8-inch square baking dish. Mix brown sugar and remaining granulated sugar, flour and cinnamon in medium bowl. Cut in butter with pastry blender or 2 knives until mixture forms coarse crumbs. Stir in nuts; sprinkle over pears. Bake 40 to 45 min. or until topping is golden brown and pears are hot and bubbly. Serve topped with Cool Whip. Look for pears with a fragrant aroma and coloring characteristic of their variety. Skins should be free from cuts and bruises. A ripe pear is one that feels slightly firm, but gives a bit to gentle pressure at the stem end. Bake dessert in 9-inch square baking dish or shallow 2-L casserole instead of the 8-inch square baking dish.